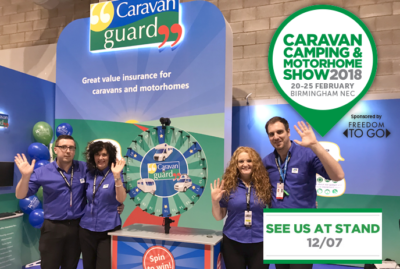 The start-of-the-season showcase kicks off at Birmingham’s NEC next month with the the latest caravans, motorhomes, campervans, trailer tents, folding campers and much more on display at the Caravan, Camping and Motorhome Show 2018! This year’s Caravan, Camping and Motorhome Show runs from February 20th to 25th and new-for-2018 attractions including a skate rink and holiday park experience, as well as other free activities and advice on exploring UK and overseas camping destinations. There’ll also be a multitude of camping and outdoor leisure accessories on display and plenty of talks and demonstrations in the Discovery Theatre. A celebrity line-up is headed by explorer Sir Ranulph Fiennes sharing his adventuring experiences, as well as ideas on why everyone should spend ’24 hours outdoors’ in 2018. Show visitors can also try their hand at motorhome manoeuvring, campervan test driving and caravan towing, and The Woodland Trust will be offering inspiration on walks and getting outdoors. 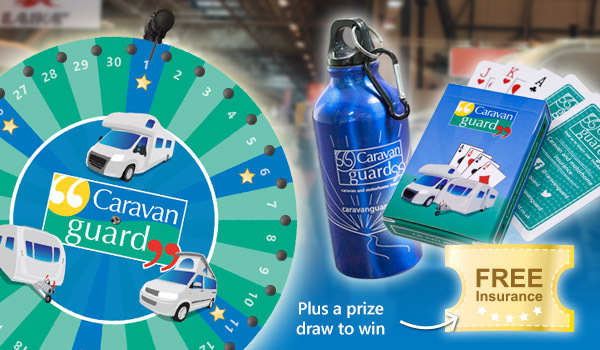 Our team of caravan, trailer tent, motorhome, and campervan insurance experts will be on hand to talk about insuring your leisure vehicle and visitors to our stand can play our brilliant”Wheel of Fortune” game for a one-in-five chance to win one of our cool, metallic water bottles or a pack of Caravan Guard playing cards. Everyone who takes part will also be entered into a prize draw to win a year’s free caravan or motorhome insurance. Just drop on by to hall one, stand 12:07. Tickets are on sale now for the Caravan, Camping and Motorhome Show 2018 from as little as £8.25**. To book tickets call 0844 873 7333 or visit www.ccmshow.co.uk. Hi your competiton states closing date 4th February 2018 but when I just tried to enter it told me the closing date had elapsed ..But it is only 22 January 2018 ?! I can assure you the competition is still open and we are still taking entries Vicky. Once you’ve submitted your entry you should receive the following message: Once the closing date for entries of 4th February 2018 has elapsed, we will contact the winning entries and post about it on our blog. Should you not hear from us after two weeks after the closing date, you have not won on this occasion. Hi Vicky, I’ve checked our system and we have your entry. Good luck!